Cuban pitcher Alejandro Eskenazi is participating in a professional internship organized by the Masa Israel Journey program. TEL AVIV (JTA) – Unlike the dangerous maritime escapes attempted by some of his fellow Cuban baseball players, the worst Alejandro Eskenazi endured to leave the island nation was a mountain of paperwork. The documents he gathered and the forms he completed took eight months to process, delaying the Havana native’s arrival in Israel until last August. But coaching Israeli youngsters in baseball and playing in a league here made the wait worth it for Eskenazi, who is participating in a professional internship organized by the Masa Israel Journey program. Eskenazi, 27, came here on a one-year student visa and is now a citizen. In flawless English, Eskenazi explained that he did not flee Cuba and can return for visits or to live. He also said his parents – father Jaime is a mechanical engineer and mother Juanna teaches in a boarding school – face no repercussions from their son’s departure. Jewish Cubans, Eskenazi said, can travel abroad fairly freely. Eskenazi is the first Cuban athlete to participate in Masa, and teamwork involving American donors and Canadian and Israeli diplomats was needed for Eskenazi to reach Israel this time -- he had been there three times. With Israel and Cuba lacking diplomatic relations, Canada’s embassy in Havana and Israel’s embassy in Ottawa served as intermediaries. “We thought, what a wonderful way to give him opportunities outside Cuba,” said Tony Kahan, a Chicago real-estate developer who with four friends contributed $10,000 toward Eskenazi’s flights and living expenses. Kahan said he met Eskenazi at the Maccabiah Games in 2013 and during a visit to Cuba and came away impressed. “He’s a hard-working, honest, good kid. My parents worked to get refuseniks out of Russia. This was my refusenik moment – helping someone get to Israel,” he said. Eskenazi had visited Israel on a Birthright trip in 2009, as a Birthright leader in 2011 and as a player on Cuba’s softball team at the Maccabiah Games four years ago. The last trip cemented in his mind the plan to move to Israel. “I’d finished my degree, so I was prepared. I realized I wanted to make aliyah,” he said. He acknowledges missing his mother and father, whom he calls weekly. Via Facebook, Eskenazi stays in touch with baseball-playing friends who escaped to the United States and the Dominican Republic. Baseball officials here said that they became enamored with Eskenazi’s personality and love of coaching. Envisioning him pitching for the Israeli national team didn’t hurt, either. Eskenazi played and coached in a Havana baseball academy, and wants to continue on those paths in Israel. He turned his phone to display photographs of two friends: Arizona Diamondbacks outfielder Yasmany Tomas, his teammate on a Havana youth club, and a Toronto Blue Jays’ prospect, infielder-outfielder Lourdes Gurriel. Eskenazi hopes to interest them and other Cuban baseball-playing friends in the United States, none of them Jewish, in coaching in Israel, too. Eskenazi wants to spread the baseball gospel by visiting schools across the country and interesting administrators in the sport. He’d like to create a program to train Israelis as coaches and building a baseball infrastructure in a country with only a handful of baseball fields. After graduating with a degree in physical education from Havana’s Manuel Fajardo University of Physical Culture and Sports Sciences, Eskenazi worked as a personal trainer. Following major league games was difficult because of poor internet access, so Eskenazi and his friends downloaded video clips when possible and passed them around on flash drives. His favorite players, both now retired, were Greg Maddux, then of the Atlanta Braves, for his ability to mix pitches, and Yankees shortstop Derek Jeter. 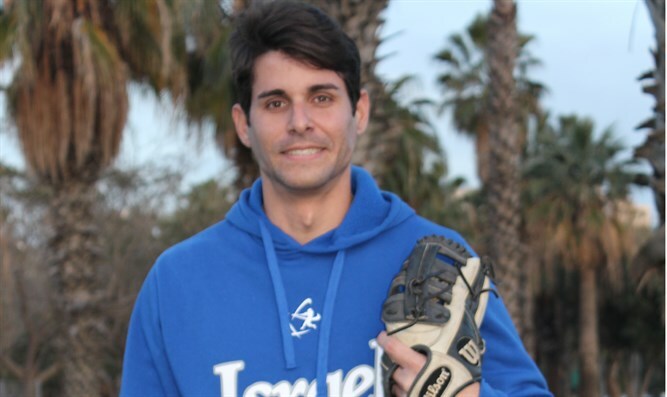 As a pitcher, Eskenazi is “a huge addition” to the Israeli national team, said Ophir Katz, director of development for the Israel Association of Baseball. The squad will play in a European tournament next summer. “He’s a few levels above the others in the [Israeli] league. He is a dominant starting pitcher, so for short tournaments, that’s huge,” said Katz, who called the slider Eskenazi’s best pitch. On a warm January evening in this city’s Yarkon Park, Eskenazi led a group of 25 youngsters in runs and throwing drills. They trained on the blacktop of two illuminated basketball courts because the vast park’s sole baseball field lacks lighting. Later, he taught players the grip for throwing a change-up.